One day in mid February, I wanted to practice with values and very quick sketches. I had a busy day, so I snuck in two drawing sessions: one at home, and one at work. That would be what I set out do on this day! First, early morning at home with Pitt calligraphy pen, warming up, practicing with thumbnail concept and value. This is images 1 and 2 below. This was about 15 minutes... though I confess I spent a lot of time looking and taking notes and not actually drawing. One thing I noticed about values in my home that I hadn't noticed before: My house is in the woods (I'm very lucky) and has huge windows on all the windows of the main rooms. Nearly floor to ceiling windows. So there is always (in the daytime) light coming from multiple sources and a lot of brightness. And almost any way you look at something it is backlit. Given that three of my four animals are black (or black and brindled), and given that I look at them a lot, I realized today how much of what I see during my daily life is in high contrast! Like the Notan idea. That had NEVER occurred to me before. I walked around kind of in awe--my furniture, many knick knacks, certainly my animals, backlit much of the time because of the windows! So that was an interesting aha! Of course, at night, it a completely different house--full of color and earth tones. My second drawing session today came at a lunchtime meeting. Here I was drawing with a beloved Tombow monoball fine rollerball pen (which I think are no longer being made, and this is my last one, sigh!) on Tomoe River paper, in a handmade journal. This is very smooth, very thin, non-bleeding paper which I love, even though it isn't completely opaque. My goal was to really experiment with the notion of thumbnails to think about composition and value with moving subjects in an environment I couldn't control. This is images 3, 4, and 5. In #3, I wanted to capture the weird shadowy lighting of the room. I think this is pretty accurate, value-wise, and indicates to me that it wouldn't be a subject I would choose! But it was a really valuable thumbnail to do because I SAW and UNDERSTOOD it. #4 is one of my colleagues. It came out a bit more detailed than I had intended but I did it really fast, focused on the negative space around his head inside the thumbnail frame. Actually, I'm quite enamored of this quick sketch because I felt like it did some of my main goals for my sketching: fast, loose, yet accurate and attractive. It was a big moment for me of thinking "progress!" #5 is some thumbnail practice. 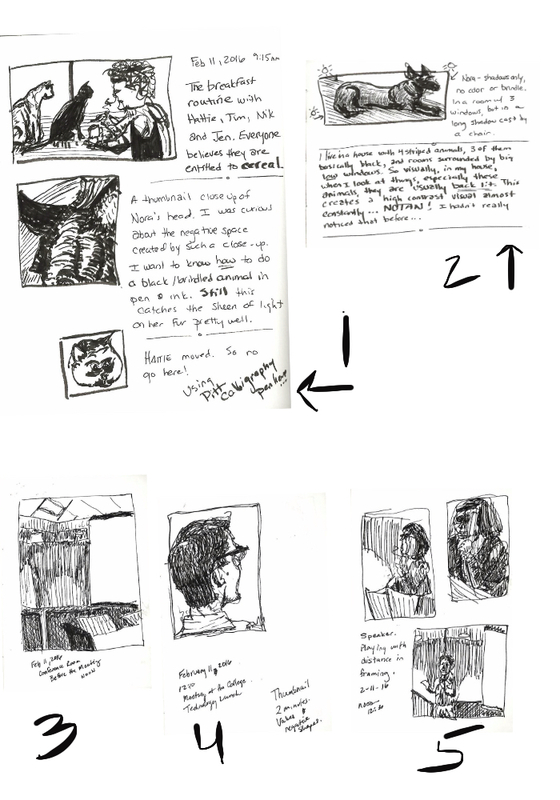 I did three thumbnails of the same things, but composing the picture differently each time. It was a speaker, in dim light but with sharp light cast from above front and above behind. I tried framing it close, mid-range, and distant. I tried capturing the value shifts in a dim room. It was an extremely good exercise--I learned a lot by looking and looking. I listed a lot of things above that I liked about the whole experience. I'd add that I am so grateful to continually discover how much more interesting the whole world is when you draw it--even a meeting in a dimly lit room! This post comes from work I did in a class with Roz Stendahl, Drawing Practice: Drawing Live Subjects in Public. I recommend it to everyone!